Clastic sedimentary rocks are formed from other, eroded rock material. The rock material that is eroded from existing rock is transported by water and wind before it is deposited in the bottom of water bodies, in deserts or on beaches where it will finally turn into sedimentary rock under the pressure of more and more layers. During the transport the grain sizes are sorted. Clastic sedimentary rocks can be classified according to clast size, but also composition, cement character, and how well sorted the clast sizes are. Below are the rocks of this group from largest to finest clast size. 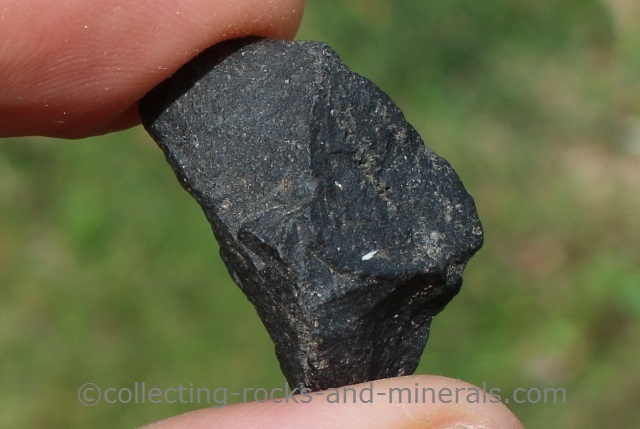 Conglomerate is a rock easy to recognise because of the large clasts which are round - they have been pebbles. The clasts are mostly quartz, but can be a variety of different minerals or rock such as limestone and others in polygenetic conglomerate. The matrix is usually sandstone. Conglomerate is often found in association with sandstone. There are no fossils. Breccia is also coarse grained but the difference is that breccia's large fragments are not round but anguar. This shows that they have not been transported very far from their source. 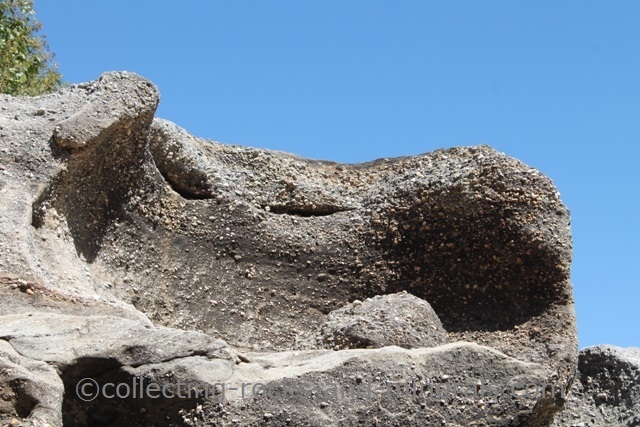 The large fragments can be of any rock but they are made of limestone in limestone breccia. Matrix is usually made of sandstone. Fossils are uncommon in breccia, but more common in limestone breccia. 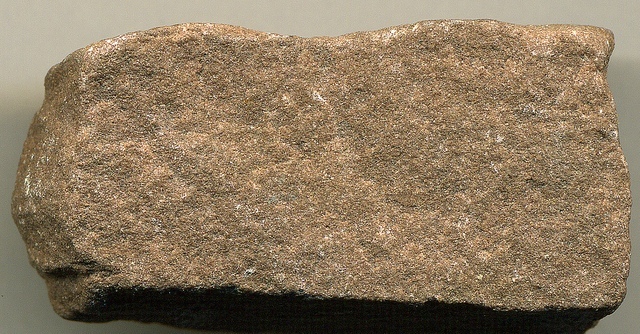 Sandstone has a medium grain size and is one of the most common sedimentary rocks. Like sand, it contains a lot of quartz - a hard mineral which requires that sand is cemented together to turn into sandstone. Other minerals may be feldspars and micas; and the grains are cemented by calcite, silica, or iron oxides. Bedding layers are often visible. 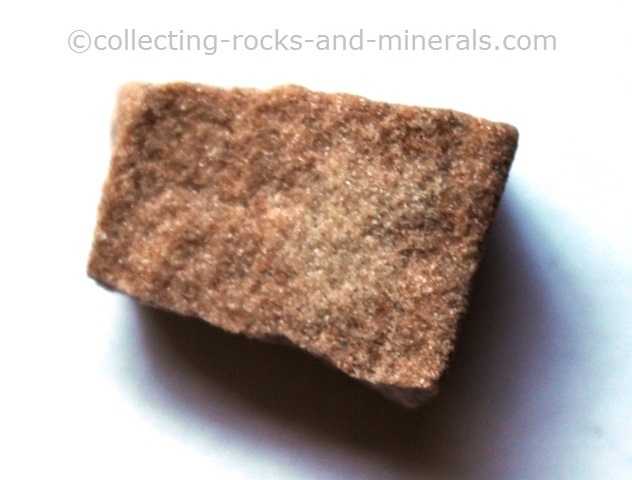 In micaceous sandstone, large mica minerals are present. It can vary in colour between red, brown, white or grey. Siltstone is similar in appearance to mudstone but it contains more quartz. Its grain size is fine, between the sizes of sandstone and mudstone. Like sandstone, it can have different colours and textures. It can also form in different environments. It is most often grey or reddish in colour. It is laminated, and it often contains carbonates and sometimes fossils. 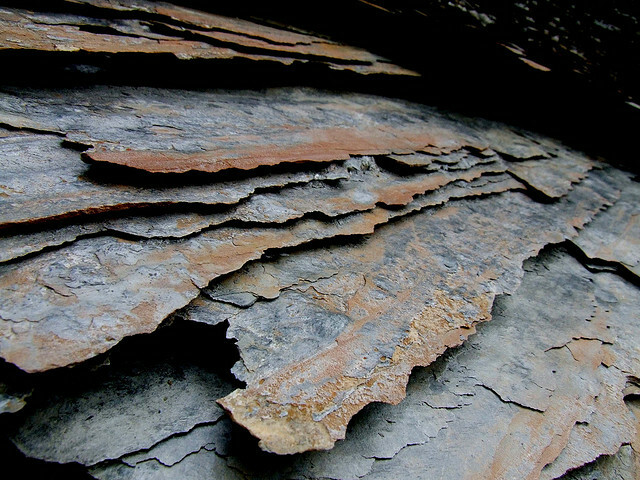 Shale is an interesting rock that is known for its fantastic layers and the ability to break along them. It has consequently been widely used when building roofs, making bricks, and tiles. 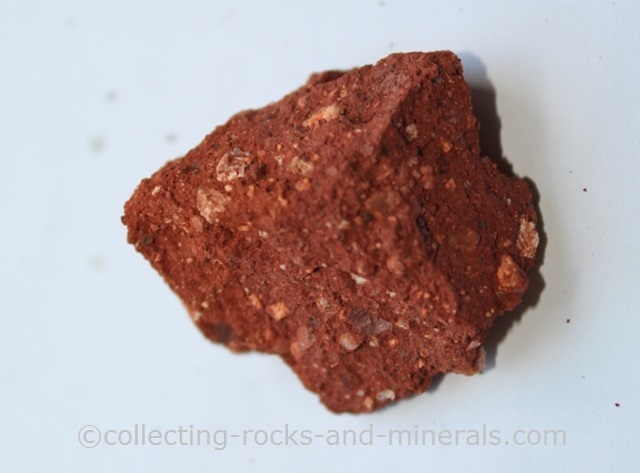 Without its fissility it would resemble mudstone when it comes to colour and grain size. It can contain fossils, and its main minerals are quartz, clays and mica. Shale is the most common of clastic sedimentary rocks. Mudstone is a black or grey rock with a very fine grain size. Although the grains cannot be seen with bare eyes, it contains quartz, mica, feldspars, different clay minerals and sometimes carbonates, iron oxides and/or fossils. It can be similar to shale, except that it is not nearly as well laminated as shale is. It forms from mud sediments in the bottom of waterbodies.